Homepage. This page: A selection of original petrol rationing tokens issued to motorists in the years following WW2. Fuel shortages, actual and threatened, reared their heads a number of times in the years following WW2, what with the postwar rebuilding of Britain after the Luftwaffe's attentions, the Suez crisis of the 1950s, and the oil shortages of the early 1970s. Shown on this page is a selection of fuel rationing tokens from various years. Most of them are British, and one from the other side of the Channel in France. The 1940s rations book pictured above still has half of the cover attached, with one of the coupons inside visible to the right of the scan. 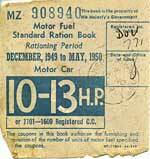 This particular 'Motor Fuel Standard Ration Book' covered the period December 1949 through to May 1950, and was applicable to cars of 20HP and over (HP being the RAC's engine rating, not brake horsepower). The car is was issued to was registered DYR 689, but sadly I've no record of what car that was. We still had a King in those days, 'this book is the property of His Majesty's Government' - hmm I must send it back in sometime!! A close up of a similar coupon to that found in the book of coupons at the top of this page. 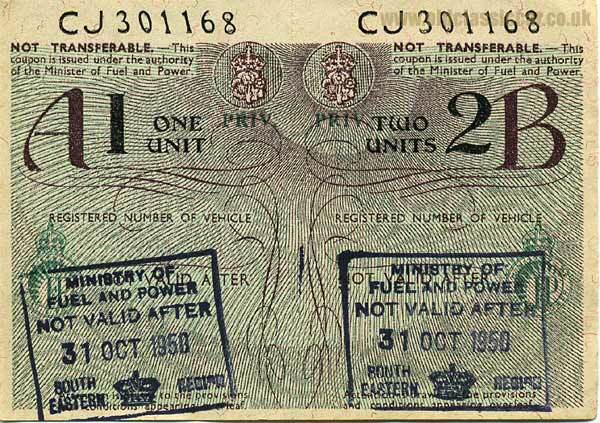 This was to be used in February 1950, and was issued, like the others, by the Minister Of Fuel and Power. 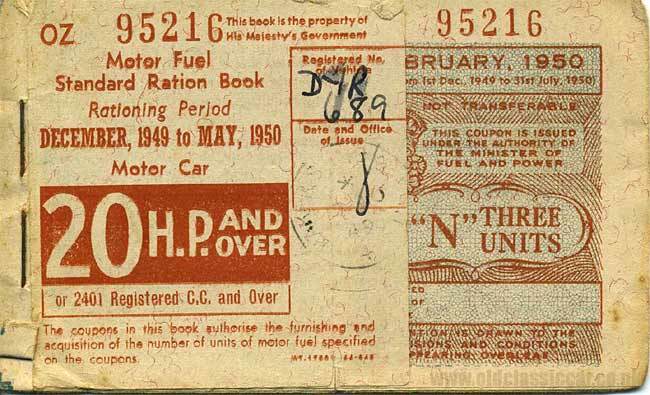 This single fuel coupon is for a smaller, 10HP - 13HP, car in 1949/1950, so something like a small Austin or Morris perhaps. The car, whatever it was, was registered DOU 771, and the coupon was franked on 17th November 1949. 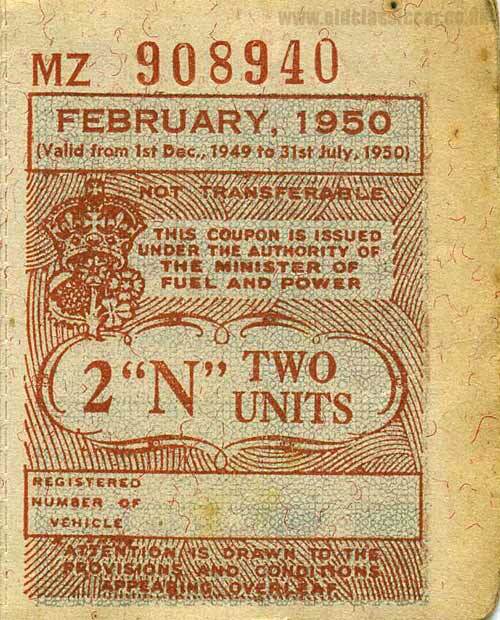 Here are two petrol rationing coupons of a different style, this time dating to 1950. This particular sheet of fuel coupons is much later, issued (but not used) in the early 1970s when things were getting sticky in the oil world. It was issued by BP Co. Ltd in October 1971. Apparently, these 'S' coupons were for PSV, Buses and Coaches (thanks Steve). 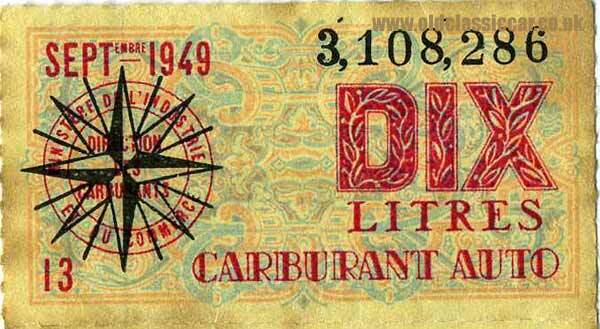 Finally, a coupon from a sheet of three, rationing Monsieur Le Motorist to units of 10 Litres of French motor fuel ('Carburant Auto'), in September 1949. Again, no details of the make or model of car are given. 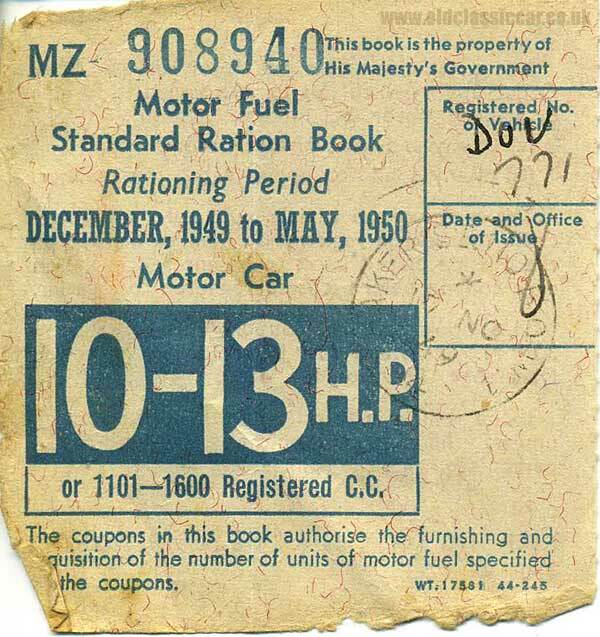 More information about fuel rationing in the UK. "I'm a stamp collector with an interest in military mail but have a collection related to the 'Home Front' of WWI & WWII ration books. 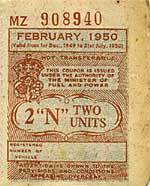 Thought you would like to know there have been two periods of rationing: 1939 - 1950 and 1956, also for which coupons were issued but never brought into use in 1973. A few details, 2nd September 1939 - All driving tests were suspended because of the war. The only exception was for military personnel. 3rd September 1939 - Petrol rationed allowing approximately 200 miles of travel per month for each car. During the war car radios were also banned. It became an offence for any person to have in his or her possession or under his or her control any radio receiving apparatus installed in any motor vehicle. In June 1940 the first car radio fine to be handed out was give to Vince De Duca, a British Born subject, who was fined £5 at Glasgow magistrates court. In the summer of 1942, after the Japanese Army occupied Malaya, and the success of the U-boat attacks on the Atlantic convoys, oil supplies and rubber to Britain were cut considerably. This could only mean one thing. 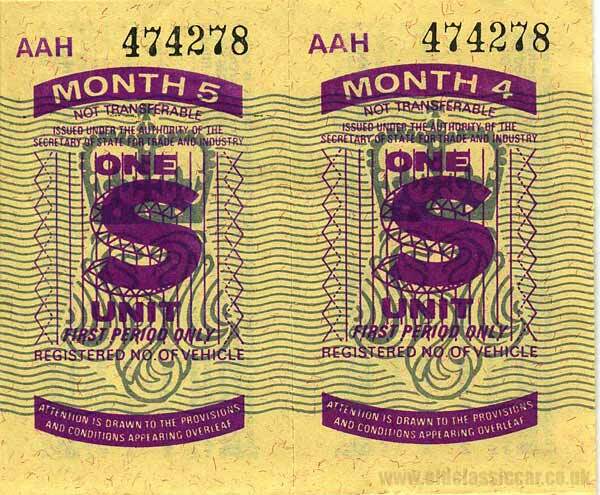 Petrol rationing was cut altogether for the private motorist, petrol was now only available to licensed users whose essential needs were given priority. The ordinary motorist had to do without. 1946 Motor Fuel Ration Book; for the six months September 1946 to February 1947, Private motor Car over 20 H.P. 1947 Motor Fuel Ration Book; for the six months September 1947 to February 1948, Private motor Car 1-9 H.P. 1947 Motor Fuel Ration Book; for the six months September 1947 to February 1948, Private motor Car 10-13 H.P. 1949-50 Motor Fuel Ration Book; for the six months December 1949 to May 1950, M/C not exceeding 250 c.c. 1949-50 Motor Fuel Ration Book; for the six months December 1949 to May 1950, Private motor Car 1-9 H.P. 1950 Motor Fuel Standard Ration Book, Rationing Period June to November 1950, Motor Car 10-13 H.P. It would seem coupons were issued for for various classes - M/c up to 250cc, cars 1 - 9hp; 10 - 13hp; 14 - 19hp and over 20hp. 1942 Control of Rubber Tyre's (No. 4) Order, 1942 - Tyre application Form, T.F.A.I. The Government of Ceylon issued special Export Coupons for Dry Rubber in 1941 and 1942 to planters to stop the black market in the product. It seems from some references they were used as a form of currency between the planters. 1956 Motor Fuel Ration Book, Motor Car (inc. Tricycle) not exceeding 9 H.P. 1956 Motor Fuel Ration Book, Motor Car, not exceeding 13 H.P. We lived opposite a petrol station and I remember the queues, I was only 11 years old at the time. 1973 Motor Fuel Ration Book, Motor Car over 20 H.P. Hope that's of interest, I can let you have more information re 1956 and 1973 if you want it." Thanks for sending the info in Steve, good stuff. I hadn't realised that there were restrictions on rubber supplies and also the ownership and use of car radios. Return to the motoring collectables page for more offbeat items relating to motoring and the highway in bygone times.